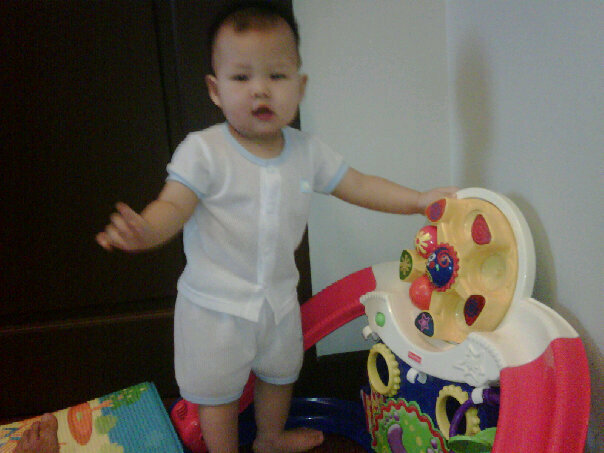 Yvonne's parenting journey, wellness and tips, photography blog: Marcus is now 10 months old!!! Marcus is now 10 months old!!! Today Marcus turns 10 months!! This flies real fast.. I am still remember clearly the day I was in labor room.. it was just like yesterday!!! mama.. real busy and has no time to record down what you have done and achieve for few months.. so now is time to give little accomplishment!!! Physical - Sitting Confidently.. bend knees and sit... from sitting to kneeing to standing (at around 9 months).. (he kind of skip the pulling himself up from sitting to standing).. Standing without support.. combat crawling - real fast one.. A little bit of crawling on all four.. using fingers very well - pincer grasps - grip tiny things (finger food and put inside his mouth).. squatting.. Start cruising around the furniture - even let go both hand and switch from one furniture to another.. he will shake his head to say "No" i dont want eat!!! Feeding himself with fingers.. very good hand eye coordination.. Language - he say mama and papa on my birthday 6 July 2010 (9mths old).. it was a great present from him.. such a sweetie pie..
His papa keep saying want him to attend the shicida class since he was only 4 months old.. but until now he never get action to enrolled him.. (papa pattern.. always tell the direction and mama please implement it!!) So.. I think I will need to go and check out the schedule for Marcus.. I am also trying to flash card for him for few months.. but I am a bit lazy so it doesn't happened everyday.. And seem he can't sit and wait me to flash the card.. he want to eat the flash card.. and come eagerly towards me..